Q: What did you think of films? Me, I would have liked to see another thing, an environment like that of The Seventh Seal, of Bergman. It would have been interesting to make a series, which would have made it possible to develop a movie adaptation, without losing the breath. I am not surprised by this response of J.R.R.T.’s grandson. Someone being so close to the book and the author would, I think, want to see the depth, breadth and pace of the book reproduced in the films. I felt the same way, although I know that anyone who would want to tackle the story was going to need a lot of money and would have to convince a studio that the films were going to be blockbusters. I think this factor more than anything else necessitated the transformation of the story into a kind of adventure/thriller. His suggestion that the environment should be more like The Seventh Seal, I find intriguing. 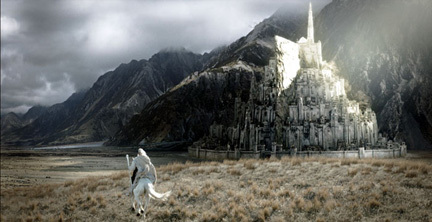 I admit that I got tired of the ubiquitous cgi camera that flew through the orc tunnels under Orthanc like a video game, and the fighter pilot view of the Nazgul on their fell beasts over Gondor. Adam is right that the cgi was a bit too transparent, but for me, even were the cgi better, I think it was still too much. For example, the momentary glimpses of the Nazgul in the sky from the point of view of Frodo and Smeagol would have been much more effective, frightening and realistic. . . and cheaper . . . and more like the book. In general, I would have liked to see much more subtlety, but of course, the series would have to have been much longer, perhaps like a cable series, instead of big screen films. Here is an example of The Seventh Seal. This entry was posted in Culture, News, Tolkien and tagged Ingmar Bergman, Movies, Peter Jackson, The Lord of the Rings, The Seventh Seal by Fr. Angelo M. Geiger. Bookmark the permalink.